Shoot for the moon in the new celestial slot game from Playtech – Yutu. It’s been released exclusively early too so find out more below. Yutu is a 5 reel, 50 slot game which is quite simple in terms of design – it follows the same design principles as Big Bear (by Playtech obviously). Playable from 50p a spin across all devices, this Chinese themed offering focuses on a lunar rabbit (or lucky moon rabbit) – it appears stacked on all reels. Yutu is all about the Free Spins feature where you’ll begin with 10 free spins. With 5 more free spins to be won, an additional wild symbol is added to all reels (bar reel 1) after every free spin – this can lead to plenty of wilds on your last free spins. Simple it may be but you can win 1,000 times your stake on each spin – the likelihood of winning big obviously increases in the Free Spins feature due to the added wilds. For more info, and to try for free, visit the Yutu review where you’ll hopefully benefit from heavenly win potential. 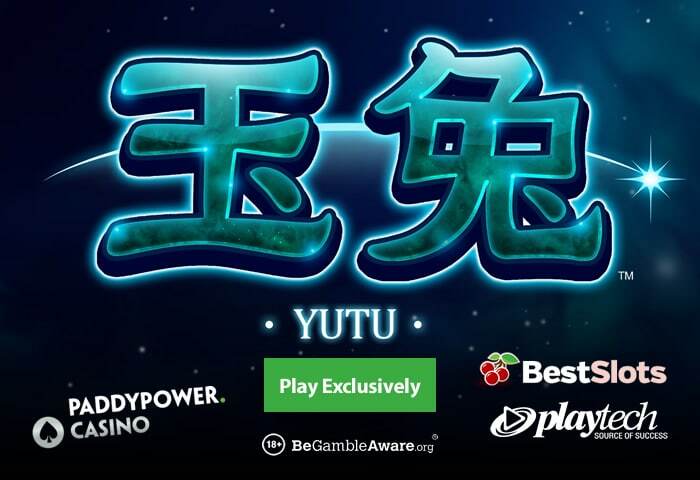 The Yutu slot game is only available to play, for now, at Paddy Power Casino – they are the only online casino to have Playtech’s Big Bear too. Other new Playtech slot games include Coin! Coin! Coin!, Age of the Gods: Mighty Midas and Galactic Streak. Famously known for their tongue-in-cheek advertising, Paddy Power operates a seriously good online casino – with 24/7 customer support, they offer cashouts within hours and with no fees either. They also offer a steady stream of promotions and giveaways. Sign up and choose from 2 welcome offers – you can deposit £100 to get a 200% match bonus up to £200 or deposit just £10 to get a £40 bonus and 20 wager-free free spins.